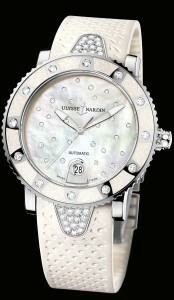 Stainless steel 40mm case, with date, automatic movement, 27 diamonds on white mother of pearl dial. 12 diamonds are set on the bezel. It features a glass back exhibition case with the visible rotor engraved with the Ulysse Nardin name and anchor logo. It is available on a sporty white rubber strap.